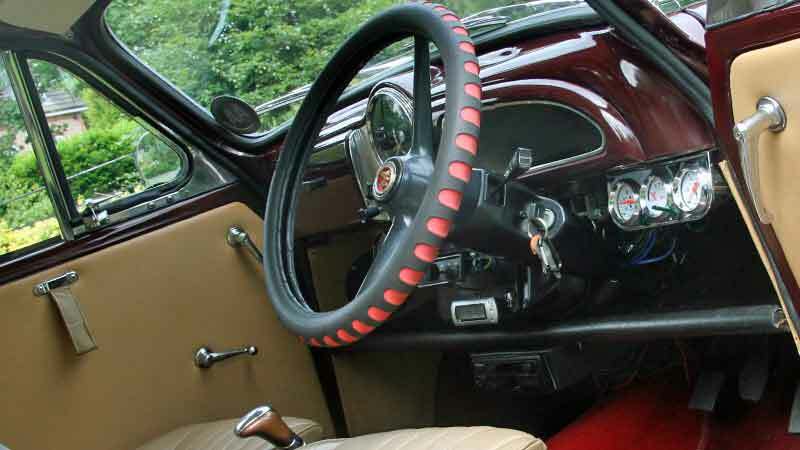 Why hire a Morris Minor Traveller? This trusty 1960s classic car, nicknamed the ‘Woody’ because of its wooden (ash) frame, brings back many fond memories. For a fantastic classic car experience grab a picnic, stow it in the roomy boot, and head off for the Yorkshire or Lancashire countryside. You’ll have great fun in our Morris Minor Traveller hire car. Our Traveller’s deluxe interior and engine upgrade also make it perfect for a short break or classic car holiday. Having so much glass, a Traveller’s got great all round visibility. For panoramic views as you drive through the Dales or North York Moors, you can’t beat it. Our four seater Morris Minor Traveller hire car is maroon with a non-standard cream leather interior and reclining Jaguar front seats. Manufactured in 1967, it was restored between 1998 and 2002. The engine was upgraded to 1275cc. The Traveller has also been converted to a 5 speed manual gearbox and the brakes have been upgraded. This means it’s more like a modern car to drive. For example, it can maintain an easy motorway cruising speed. Other upgrades include additional lights and guages, upgrades to the controls and to the heater. A Morris Minor Traveller hire in Yorkshire lets you experience the lasting charm of this popular classic car. 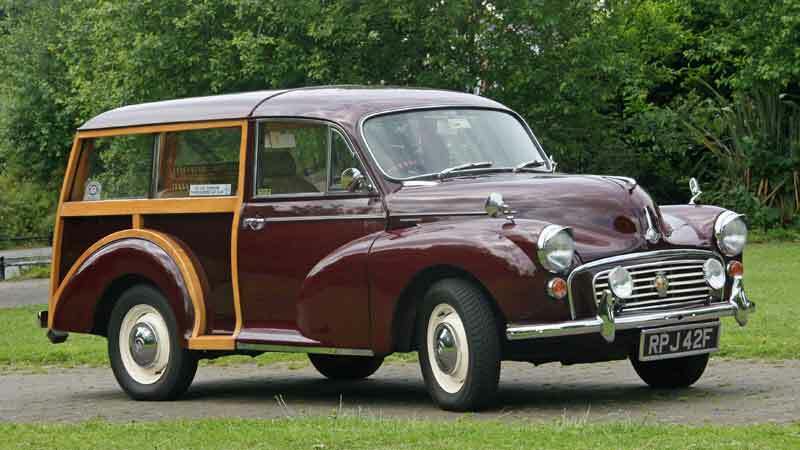 The half-timbered Morris Minor Traveller was introduced in late 1953. ‘Traveller’ was a Morris naming tradition for estate cars. Always popular, some 215,000 ‘Woodies’ were manufactured until production ended in 1971. The Traveller was of the same monocoque construction (where the chassis is integral with the body) as the Morris Minor saloon. However, it also had an exposed, structural ash frame with aluminium panels for the rear bodywork, and two side-hinged rear doors. 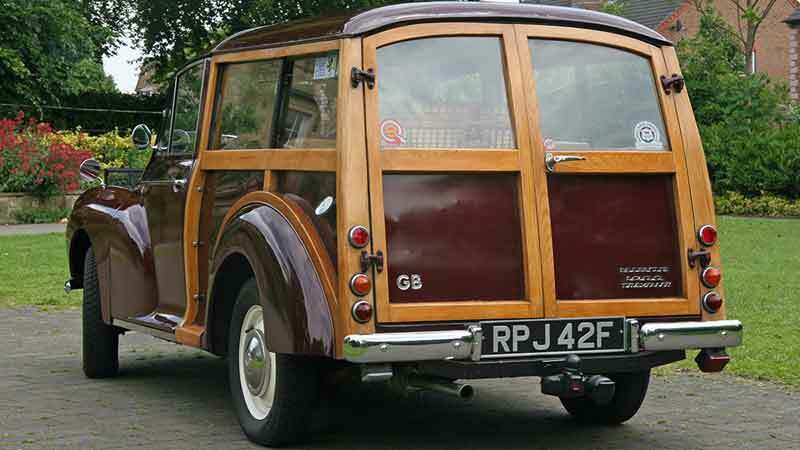 The floor and “cab” section of the Woodies were built at the main Morris plant at Cowley. Then construction continued at the MG factory at Abingdon. Here the varnished wood and aluminum rear structure was added. The woodshop at the MG factory was perfect for this part of the process. This was because the wood frame bodied MG TF had been built here, and was being phased out in favour of the all steel MGA. 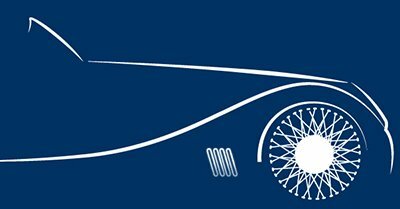 To read more about the history of the Morris Minor go to our Morris Minor Convertible page. 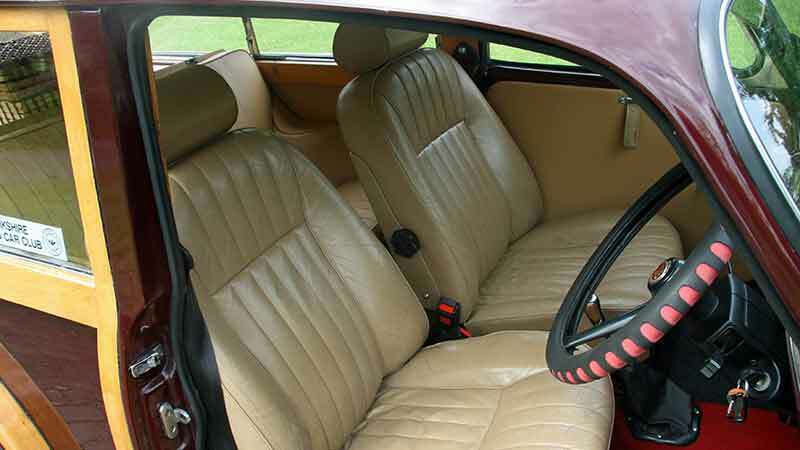 Maroon with cream leather upholstery. Our Morris Minor hire car is available for collection in Leeds, West Yorkshire. Our location is within easy reach of all the major towns and cities in the north of England. 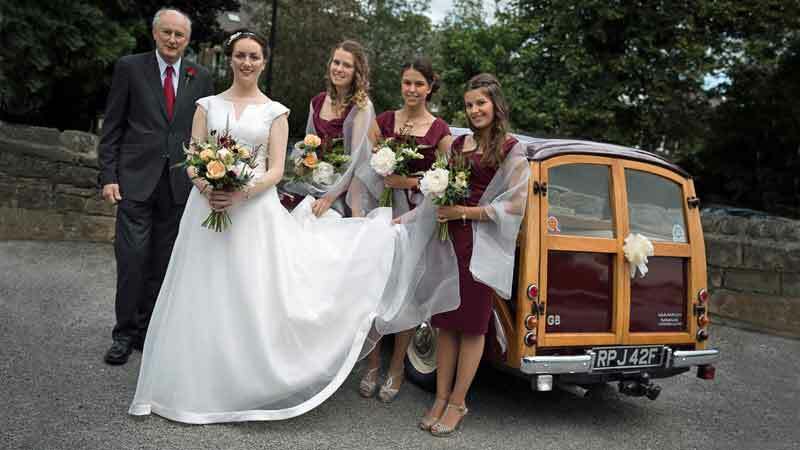 We are in an ideal location for Morris Minor Hire Huddersfield, Wakefield, and Harrogate. For Morris Minor hire Hull, Rotherham, Doncaster and Sheffield, you don’t have too far to travel either. Morris Minor hire is within about an hour’s drive of our Leeds base. As are most of the towns in South Yorkshire and North Yorkshire via the M1 or A1(M). Once you’ve collected it you can drive our Morris Minor hire car anywhere in the UK subject to our terms and conditions.